On Tuesday we started remedial work on the colossal squid and her tank. Things are going very well and to schedule. Yesterday we put up the barriers around the tank and lifted up the huge lid, using a forklift. We then drained most of the liquid out of the tank. That’s not as simple a task as it sounds, but it all went smoothly. When we first lifted the lid off the tank the team were relieved that there was no smell of sulphur, which would have been evidence of sulphides. The smell was “squiddy” (a smell some of us have grown to know and love), rather than “sulphury” and indicates that there hasn’t been any bacterial activity. With the liquid out of the tank the team, including our conservator Robert Clendon, could get a good look at the squid specimen and start to check out what’s been going on in the tank. Here you can see the squid specimen carefully covered up in a big sheet of thick plastic. As someone just said, it looks a bit like a rather horrible crime scene…. and the sight of those big pink tentacles and arms through the plastic is a little weird. 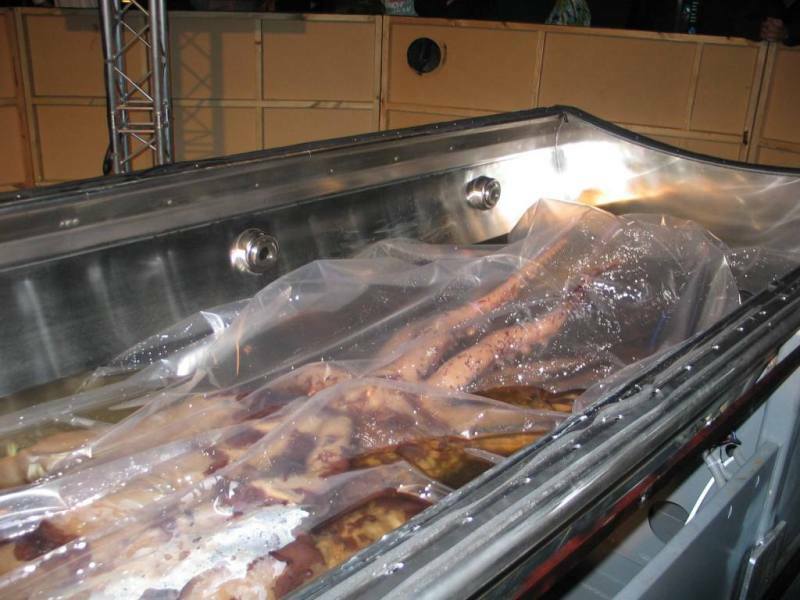 The colossal squid covered in plastic in the tank. We have taken samples from areas of concern on the squid itself and swab samples from the tank, which will go out for testing later today. The good thing is that most of what we were concerned about seems to be chemical in nature, not biological. This means the squid is not deteriorating – very important if we want to keep the specimen on display and in good condition as part of Te Papa’s collections! The seals on the tank have been inspected and the news is good here too. We are now satisfied that the sealants are not degrading, are still in good condition and are just discolouring in the glycol. 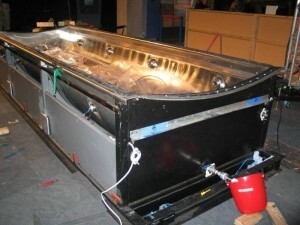 At each end of the tank we have removed the display panels and ends. They are now being altered in the workshop so that we can use a double pump to circulate the liquid in the tank more efficiently. Here you can see some of the inner workings of the tank including the drainage valve. The rather attractive, high tech bright red bucket is doing the important job of stopping any liquid dripping onto the carpet tiles! The squid tank with the display ends removed and most of the liquid drained off. When these photos were taken Robert, the conservator, and Mark the mountmaker were at a planning meeting for another exhibition. This afternoon they have started to replace the metal crimps used to make the wire mounts that hold up the arms and tentacles of the squid. The aluminium crimps had corroded away in the glycol. Aluminium is a highly reactive metal, but the replacement crimps are copper which is much less reactive but still easy to work with. Work will continue over the next couple of days and we’ll try to bring you some action shots of the team at work. HI Nathan, glad you’re back catching up with the colossal squid. She’s certainly an amazing specimen and each time we get to take a good look at her we learn more. Thanks for your interest, Pamela.